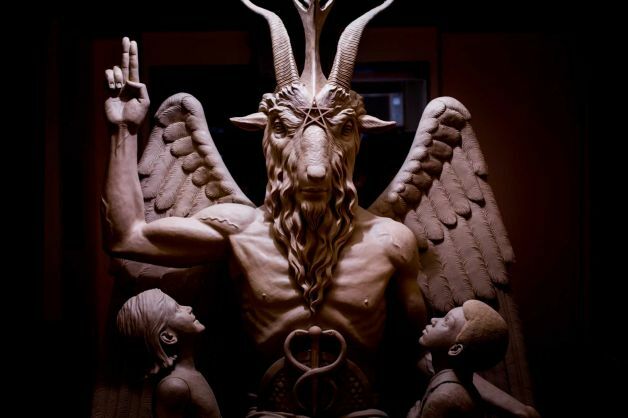 DETROIT, Mich. — The unveiling of a Satanic statue depicting Baphomet being flanked by children has been moved to a secret ticketed location and the original venue has pulled out of the event. As previously reported, the New York-based Satanic Temple had scheduled the unveiling for July 25th as it had been booked at Bert’s Warehouse in Detroit. The group says that it chose Detroit because it has a “good community” of followers, with over 200 members. But a group of pastors decided to rally against the event, and also contacted the owner of Bert’s Warehouse, Bert Dearing, to request that the Baphomet unveiling be canceled. Dearing told the Associated Press on Monday that when he realized who had booked the event and what his facility would be used for, he gave the Satanic Temple their money back. But the Satanic Temple asserts that they don’t worship the Devil. And while some believe that the group is actually run by atheists posing as Satanists, they contend that the characterization is also incorrect. Due to opposition, the Satanic Temple says that it has now moved the event to secret venue in the city and admission will be ticketed. While the unveiling is set to take place in Detroit, the group says that the statue will not remain there. The Satanic Temple had raised funds in 2013 to have the statue created in its effort to make a statement about the Ten Commandments monument at the Oklahoma state capitol, and sought to have the Baphomet monument placed next to the Ten Commandments display. As previously reported, the New York-based Satanic Temple issued a news release about its intentions two years ago following the filing of a lawsuit by the American Civil Liberties Union (ACLU), which asserted that the presence of the Ten Commandments display on government property violated the Establishment Clause of the United States Constitution. Last May, it was announced that the statue was nearing completion, which features the goat-headed figure Baphomet making the sign for the occult as he sits upon a throne with a pentagram overhead. Children fixate their eyes upon him on both sides. In September, Seventh District Court Judge Thomas Prince concluded that the Ten Commandments monument serves a historical purpose and is not solely the presentment of a religious message as it sits on a plot of land that contains 51 other expressive monuments. But the case was then appealed to the Oklahoma Supreme Court, which ruled last month that the monument violates the state Constitution’s prohibition on using government property to support a religion. The case is now on appeal. Although the Oklahoma decision consequently resulted in the group nixing its plans to place the monument next to the Ten Commandments display, the unveiling is moving forward. The Satanic Temple now says that it will seek to erect the monument adjacent to a similar Decalogue display in Arkansas. The group similarly raised concerns last December when it was granted permission to erect its “snaketivity scene” near a nativity scene on the Michigan capitol grounds. The statue featured a snake wrapped around a Satanic cross, with the snake offering the book “Revolt of the Angels” as a gift.